We are excited to announce that we will be hosting our 2nd annual Paddle for a Cause event on Sunday, May 31st 2015 at 1:30p.m. 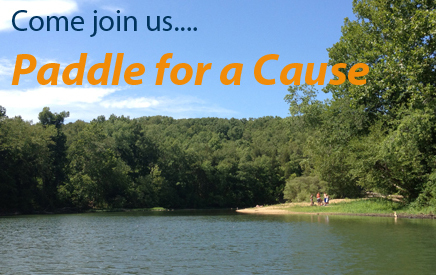 Join us for a fun-filled summertime float trip on the beautiful Courtois, Huzzah, and Meramec Rivers to raise funds for this year’s Operation Clean Stream! This family-friendly float trip is approximately 3 hours long. A delicious picnic dinner and outdoor games will follow the float. Tickets include paddles, canoes, life jackets, shuttle, and dinner. All money raised from this event will go to support Operation Clean Stream, an annual river cleanup and restoration event in the Meramec Watershed. Thanks to Missouri American Water and Ozark Outdoors for their sponsorship of Paddle for a Cause!